Australian designer Marc Newson has created a fountain pen with a retractable nib for French fashion house Hermès. Marc Newson collaborated with Hermès artistic director Pierre-Alexis Dumas to design the brand's first pen, which twists to reveal the nib. "Designing this pen was no simpler or more complicated that conceiving the inside of an aeroplane," said Newson. "The main constraint was having to fit a complex rotating mechanism into a very small space." 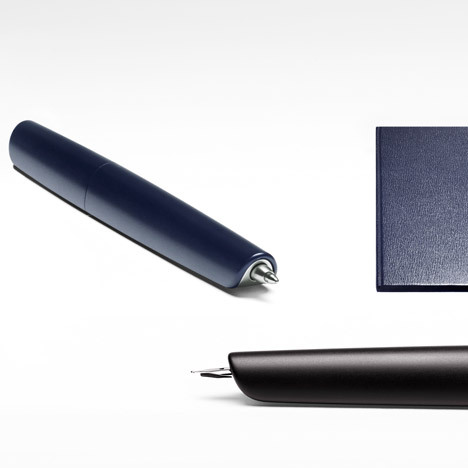 Made from aluminium and stainless steel, the pen is opened and closed by turning the body. "There's nothing technological about its appearance," said Newson. "It looks easy obvious, instinctual. But it's hiding a mechanism that's part genius, part magic." The Nautilus pen is named after Captain Nemo's submarine from the 1870 novel Twenty Thousand Leagues Under the Sea by French writer Jules Verne, admired by both Newson and Dumas. "Its spare, clean lines make it mysterious looking, nothing about it suggests that it's a pen," he said. "It has no lid, no ring, no clip." Nautilus is also available as a ballpoint version, with an ebony, red or blue body. Newson and Dumas first met in 2009 to discuss ideas for the pen, and travelled to Japan to meet manufacturer Pilot a year later. It is the first item designed in a set of writing materials that includes notebooks, papers and envelopes, as well as leather accessories. A stitched calfskin leather pouch provides a holder for the pen and cartridges come in a stainless steel box that slides out from a calfskin sheath. Newson has famously tried his hand at designing almost everything and talked through some of his key projects in a movie filmed by Dezeen in 2012.